Orbits was a venture internship during my Master's Degree program. It was a platform that facilitates innovation and motivates users to share and collaborate on ideas in real-time. Orbits reached the alpha stage of development, then we joined the start-up program e@UBC to do market research and customer discovery. Our advisory board included people working at Mozilla, the University of British Columbia, Hot Head Games, PugPharm, Hootsuite and the Centre for Digital Media. Our start-up was awarded the Masters of Digital Media Venture Internship Award, and the Gerri Sinclair Award for Innovation in Digital Media. 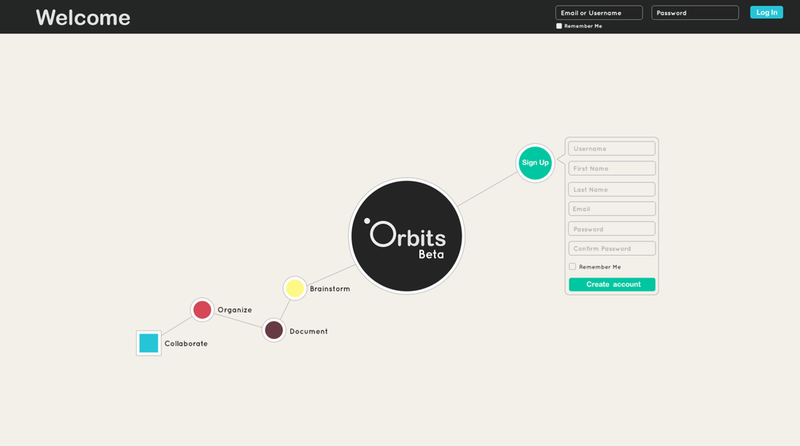 Orbits was as a crowd-sourced collaboration tool for companies, where users were able to collaborate remotely in real time with other users to develop an idea.